A colleague of mine recently gave me a dozen eggs from backyard, Berkeley-raised chickens. I haven't the slightest idea of how to raise backyard chickens (thankfully there's google for those of you who want to know); all I know is that when my friends have a plethora of eggs and the good sense to share them, I can whip up a souffle. 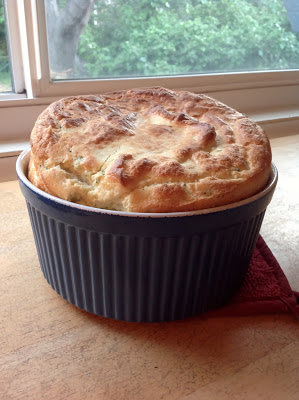 About this time a couple of years ago, I detailed my foray into souffle making, and a scientist friend of mine says that the science checks out. Since we have already discussed the souffle, let's spend a little more time with the egg itself, shall we? Eggs are graded (AA, A, or B in descending order) according to interior and exterior quality. The shells are examined for "soundness, cleanliness, shape and texture," according to my handy Food Lover's Companion, and the interior is graded through a process of "candling" (so called from the days when you would hold an egg up to a candle to examine the interior--these days, there are far more sophisticated methods with high intensity lamps and the eggs continuously moving on rollers (however, I like this romantic idea of candling)). The interior is judged by the air cell (the empty space between the white and the egg shell--the smaller the air cell, the fresher the egg), the "proportion and density of the white," and the quality and firmness of the yolk. Again, according to my handy Food Lover's Companion, the white and the yolk "stand higher, and the white spreads less than in lower-grade eggs" (196). Eggs are weighed and sorted based on minimum weight per dozen: jumbo (30 oz per dozen), extra large (27 oz), large (24 oz), medium (21 oz), small (18 oz), and peewee (15 oz). Most recipes call for large eggs, so be sure to adjust your recipes accordingly if you are using a lot of eggs and you always pick up that carton of extra large eggs. The color of the shell depends on the breed of the hen that laid it. Eggs lose most of their quality in the first day, but you can store them for up to a month in the fridge. Always store your eggs in the carton in which they came. Putting them in the egg container in the door exposes them to odors in the refrigerator, which eggs easily absorb. Bad idea. The reason it’s smarter to store your eggs with the fat end up is that the egg itself does not completely fill the interior of the shell. If you crack open a hard-boiled egg carefully at the fat end, you will see that the white part of the egg, called the albumen, does not quite reach the shell — there’s a pocket of air in-between the two. That isn’t the case for the narrow end of the egg, which fits snugly. That pocket of air allows for the presence, and reproduction, of bacteria. The color of the yolk depends on the hen's diet. Good eggs sink to in a bowl of water. Bad eggs float (because the air cell is bigger). That's it. That's all I know about eggs, or at least all I gleaned from The Food Lover's Companion and the Indiana Public Media. 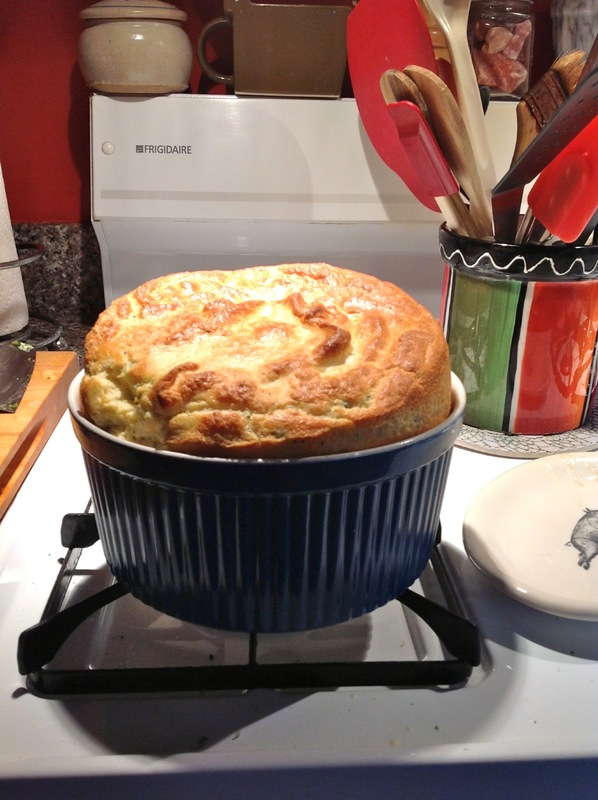 Well, I guess I also know that I appreciate it when friends give me eggs, because I like to make souffles. Really yummy souffles with broccoli and goat cheese. But that goes without saying, yes? 1. Preheat oven to 375°F. Coat four 10-ounce ramekins (or a 2- to 2 1/2-quart soufflé dish) with cooking spray place them on a baking sheet. 2. Boil a pot of water, add the broccoli, and cook until the broccoli is tender-crisp, 3 to 4 minutes (you should put the stems in first, boil for a minute, then put the florets in for the remaining 2 to 3 minutes). Drain the broccoli and put on a towel to drain briefly. Set aside. 3. Melt butter and oil in a large saucepan over medium-high heat. Whisk in flour and cook, whisking, for 1 minute. Adjust heat as needed to prevent the mixture from getting too dark; it should be the color of caramel. Add milk, mustard, rosemary and salt and cook, whisking constantly, until thickened, 1 to 2 minutes. 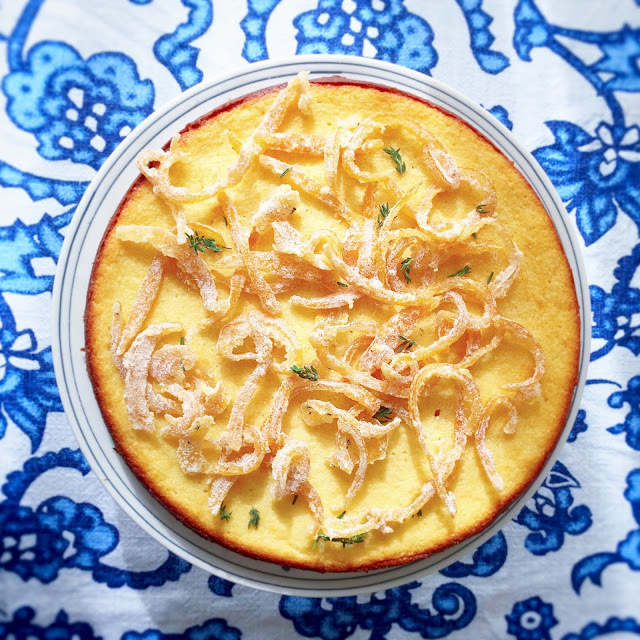 Remove from heat and immediately whisk in goat cheese and 3 egg yolks until well combined. Transfer to a large bowl. 4. Beat the 5 egg whites in a medium bowl with an electric mixer on high speed until soft peaks form. Add cream of tartar and continue beating until stiff peaks form. Using a rubber spatula, gently fold half of the whipped whites into the milk mixture. Gently fold in the remaining egg whites and the reserved broccoli just until no white streaks remain. Transfer to the prepared ramekins or soufflé dish. 5. Bake until puffed, firm to the touch and an instant-read thermometer inserted into the center registers 160°F, about 20 minutes in ramekins or 30 minutes in a soufflé dish. Serve immediately.